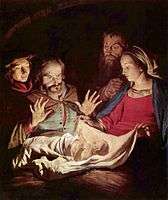 For other uses, see Adoration of the Shepherds (disambiguation). 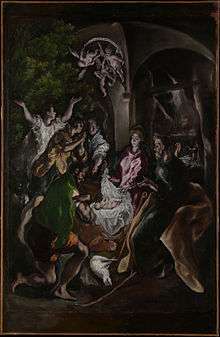 The Adoration of the Shepherds (circa 1605-10) by El Greco. 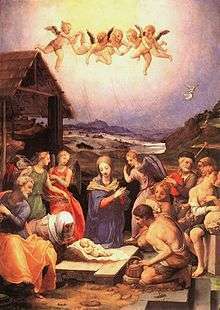 Adoration of the Shepherds by Domenico Ghirlandaio, 1485. 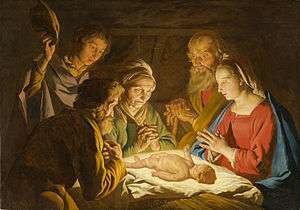 Adoration of the Shepherds by Matthias Stom, c. 1635–40. 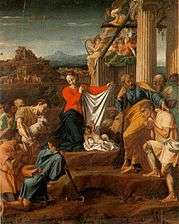 Adoration of the Shepherds by Giorgione, 1510. 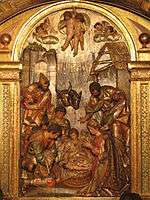 The Adoration of the Shepherds, in the Nativity of Jesus in art, is a scene in which shepherds are near witnesses to the birth of Jesus in Bethlehem, arriving soon after the actual birth. 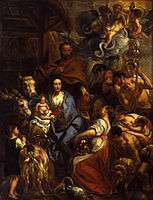 It is often combined in art with the Adoration of the Magi, in which case it is typically just referred to by the latter title. The Annunciation to the Shepherds, when they are summoned by an angel to the scene, is a distinct subject. 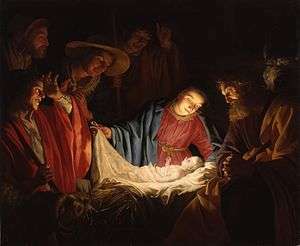 The Adoration of the Shepherds is based on the account in the Luke 2, not reported by any other Canonical Gospel, which states that an angel appeared to a group of shepherds, saying that Christ had been born in Bethlehem, followed by a crowd of angels saying Glory to God in the highest, peace on earth to men of good will. 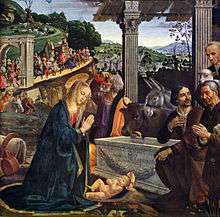 This Annunciation to the shepherds forms a distinct subject in Christian art and is sometimes included in a Nativity scene as a peripheral feature (even though it occurs prior to the adoration itself), as in the 1485 scene by Domenico Ghirlandaio, where it can be seen in the upper left corner. Ghirlandaio also shows a procession of Magi about to arrive with their gifts. 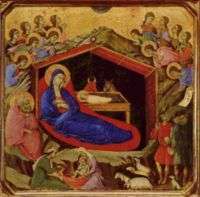 The shepherds are then described as hurrying to Bethlehem to visit Jesus, and making widely known what they had been told concerning him, before they finally return to their flocks. They praise God for "all the things that they had heard and seen, as it was told them," (Luke 2:20). Robert Gundry notes that the statement "appeals to eyewitness testimony combined with heavenly revelation." 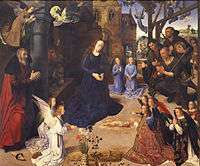 The scene is very commonly combined with the Adoration of the Magi, which makes for a balanced composition, as the two groups often occupy opposite sides of the image space around the central figures, and represent the theological interpretation of the episode where the two groups, Jewish and gentile, represented the peoples of the world between them. This combination is first found in the 6th century Monza ampullae made in Byzantine Palaestina Prima. 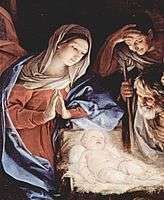 Several well-known Christmas carols mention the adoration of the shepherds. Some of these do so along the lines of urging the listener to come to Bethlehem. The modern "Calypso Carol" has the lines "Shepherds swiftly from your stupor rise / to see the Saviour of the world," and the chorus "O now carry me to Bethlehem." 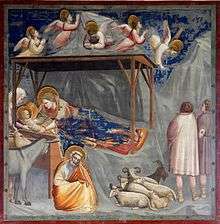 "Angels We Have Heard on High" says, "Come to Bethlehem and see / Him Whose birth the angels sing." Adoration of the Magi in the Byzantine and Christian Museum in Athens. Polidoro da Caravaggio, 16th century. Georges de La Tour ca. 1644. Ukrainian religious icon, late 17th century. Ignace Robert ca. 1691, Toul Cathedral. ↑ Robert H. Gundry, A Survey of the New Testament (4th ed., Grand Rapids: Zondervan, 2003), 218. 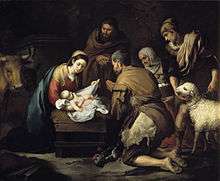 Wikimedia Commons has media related to Adoration of the Shepherds.